Leading on from Painkillers in the NFL, I’ve decided to look at non-steroidal anti-inflammatory drugs in American Football. Something I’m sure you’ll agree, is that there is huge pressure on athletes, and amateur athletes, to make a team or secure a starting position. Taking painkillers and potentially damaging the body are some of the lengths that some individuals go to in order to achieve in their sport. Non-steroidal anti-inflammatory drugs (NSAIDs) are commonly used painkillers to treat soft tissue injuries and chronic inflammatory pathologies. However, NSAIDs are not suitable for the treatment of all soft tissue injuries. This is because inflammation can play an important role in tissue repair. Some research suggests that individuals are using, and misusing, NSAIDs as a pre-game superstition and ritual. Similar, but different, to those who may touch a special object before a game or also wear the same pair of lucky socks. In comparison, methods such as these are harmless! Currently athletes have relatively unrestricted access to NSAIDs which are easily available over-the-counter. In addition, they are not considered as performance-enhancing drugs by the WADA (World Anti-Doping Agency), and therefore not banned. Even recreational sports people have been found to be regularly taking these drugs. A BBC poll found that 60% amateur athletes took anti-inflammatories, such as ibuprofen and naproxen, to support their performance or recovery at least once a week. Shockingly, at the last soccer World Cup in Brazil, over a half of the 736 players present took an NSAID during the tournament. Approximately one third of these players took a NSAID prior to each game regardless of whether they played or not. Interestingly there was no difference in the rates of NSAID use between injured and non-injured players. Similarly, research has found that NSAIDs are the most commonly used drugs by Canadian athletes. What does this mean for a contact sport such as American Football where you run and tackle the opposition at full speed? Let’s face it, our bodies aren’t as well conditioned as NFL athletes, thus causing greater injury rates. Is playing with pain an expectation in American Football? And is it expected that you should play during this pain? I recently conducted a brief twitter poll. Here’s what I found. 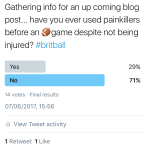 Out of all the responses, 3 in 10 players said that they had used painkillers before an American Football game despite not being injured. (This was a small poll and not necessarily representative of the wider Britball population). The side effects of NSAIDs seem to be underestimated, and I would argue that individuals aren’t always aware of possible side effects. 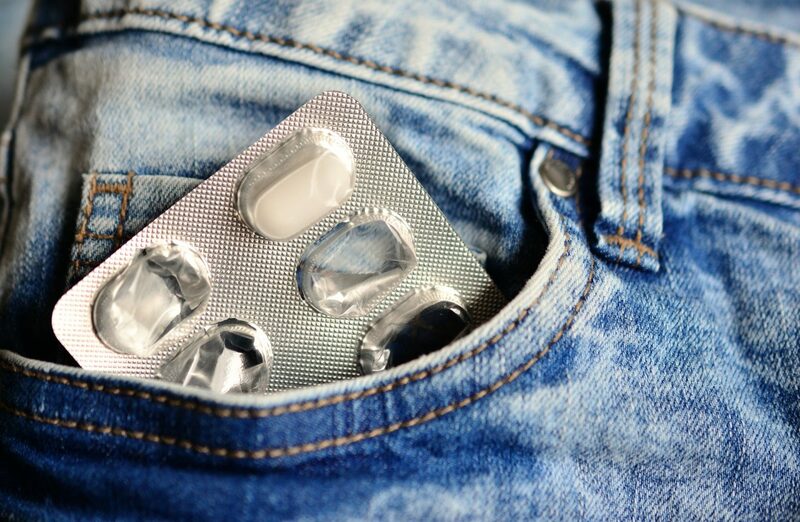 Short-term use of NSAIDs has been noted to have serious health risks. These include; kidney, gastro-intestinal side effects (ulceration, erosion, perforation, bleeding of the stomach) and cardiovascular complications. Symptoms of these can include; abdominal pain, nausea and indigestion. Furthermore, NSAIDs reduce kidney blood supply. This is unfavourable during exercise, when blood flow through the kidneys increases by 50%. This causes problems. A reduction of kidney blood flow when there is an increased kidney demand can result in permanent kidney damage. Indeed, a study in 2006 reported 10% of all kidney failure to be due to NSAID use. In addition, high doses of NSAIDs taken after single bouts of exercise have been seen to impair muscle recovery and are not effective in reducing perceived muscle soreness. Playing through this pain with the use of anti-inflammatories and overtraining could have serious effects on bone healing and fractures. This could lead to ruining any sporting career. Decreased recovery and possible prolonged pain? No thanks! There is no evidence to suggest that regular use of NSAIDs improves function in the typical athlete. Yet this does not mean that this is a final conclusion. However there is sufficient concern to be wary about the use of NSAIDs. As a rule, it is advisable that NSAIDs should not be used in the absence of any injury. Be wise! Make a conscious decision as to whether you really need to take that painkilling drug. Are there any other methods you can use? For instance, women suffering from menstrual cramps try gentle activity (e.g. a walk) and a hot water bottle to ease the monthly abomination instead. And lastly, team medics/therapists should be aware of members of the team who take NSAIDs and so are able to watch for symptoms of misuse. Lippi, G., Franchini, M. and Guidi, G.C., 2006. Non-steroidal anti-inflammatory drugs in athletes. British journal of sports medicine, 40(8), pp.661-663. Krentz, J.R., Quest, B., Farthing, J.P., Quest, D.W. and Chilibeck, P.D., 2008. The effects of ibuprofen on muscle hypertrophy, strength, and soreness during resistance training. Applied Physiology, Nutrition, and Metabolism, 33(3), pp.470-475. Da Silva, E.R., De Rose, E.H., Ribeiro, J.P., Sampedro, L.B.R., Devos, D.V., Ferreira, A.O. and Kruel, L.F.M., 2009. Non-steroidal anti-inflammatory use in the XV Pan-American Games (2007). British journal of sports medicine, p.bjsports65342. Warden, S.J., 2009. Prophylactic misuse and recommended use of non-steroidal anti-inflammatory drugs by athletes. FMA Official magazine Issue 20, Spring 2017, Pg 6-7.